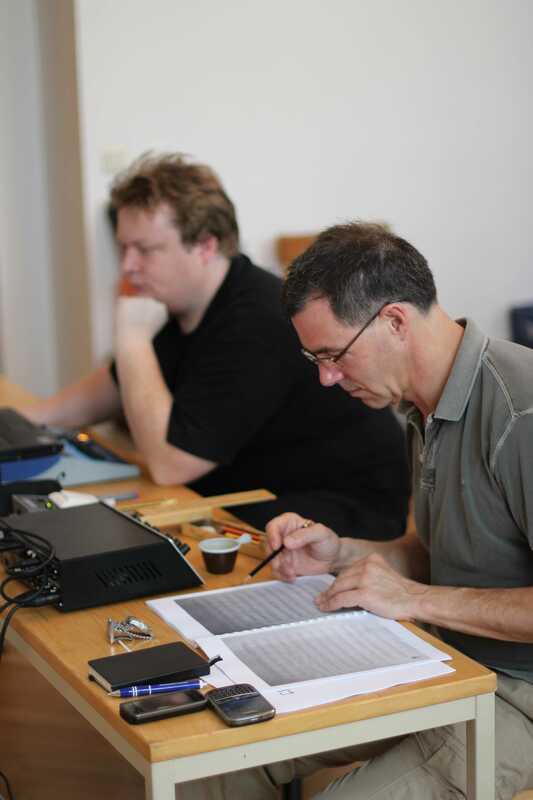 Michael Haas at the producer’s desk, with the recording engineer Georg Burdicek behind him. Photo by Rebecca Nelsen Danny. It was while I was working as music curator at the Jewish Museum in Vienna that someone told me about Robert Fürstenthal. It must have been around 2008 or 2009. He was in town with his wife Françoise. Whoever told me about Fürstenthal referred me to Professor Leopold Spitzer of the Hugo Wolf Society in Vienna, where I was told of an extraordinary composer, born in Vienna in 1920 and living in San Diego. I replied: ‘Are you sure you don’t mean Walter Arlen? He was born in Vienna in 1920 and lives in Santa Monica. We already know about him’. No. Apparently this was another Viennese composer altogether, who incredibly also lived in Southern California and, like Walter Arlen, also composed as a form of therapy. Unlike Arlen, he had no musical training and so had taught himself by taking Hugo Wolf as his teacher and model. I met the Fürstenthals at their hotel on the Schubert Ring in the middle of Vienna. We spoke in German and, unlike so many émigrés of the same generation, he spoke German as if had never left Austria. In this respect, he was like Walter Arlen in that they both spoke a rather old-fashioned language. He was jovial, extremely good-natured and kind; Françoise was reserved and kept about her the air I was already familiar with from other Viennese forced to flee for their lives after Hitler’s march into Vienna in 1938. In this respect she, rather than her husband, was more like Arlen: not at all convinced that the Viennese had changed much since then. All of them had been thrown out of the city they loved when mere teens. It happened at the worst of ages, when teenagers feel their most insecure. Having the best grades in school wouldn’t save you from being shunned and expelled by fellow classmates and teachers. Seventeen is a terrible age to be when bad things happen, and I’ve known it mark people well into later life. Robert, however, seemed quite the opposite and was both cheerful and open. He was delighted that people were apparently interested in his music. He wanted only to give pleasure by writing works people enjoyed hearing, and it made sense for him to have taken Hugo Wolf as his model: Wolf had all of the complexities and genius that were common to Viennese creativity, a neurotic mixture of Slav, Latin and German. In addition to Lieder, I learned, Fürstenthal had composed a string quartet. 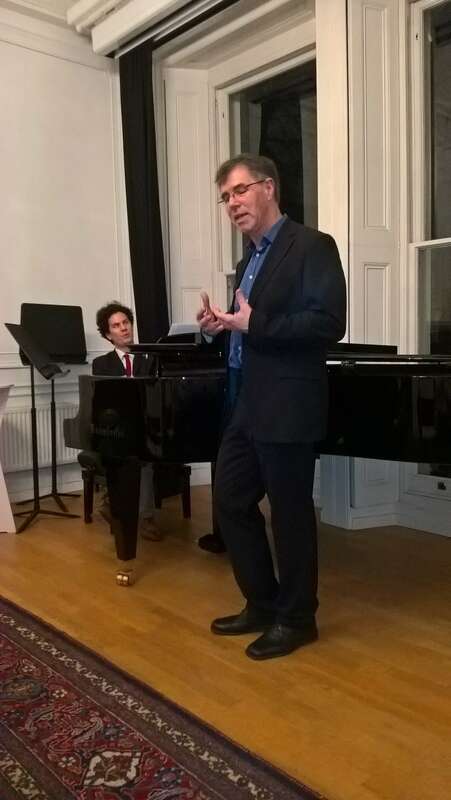 Professor Spitzer had managed to have a selection of Fürstenthal works put on as a Hugo Wolf Society event and tape the performance. Fürstenthal handed me the recording along with a hand full of scores. It was baffling to be confronted by perfectly composed works that were effectively a century ‘too late’. But the reasons he composed, the motivations and style were as intriguing as the works themselves. From a compositional standpoint, there were no technical flaws. His use of harmony and counterpoint was masterful, with modulations and juxtapositions of major and minor that were unexpected and brilliantly employed. Fundamentally, there was nothing remotely amateurish about his compositional technique. But why, unlike Arlen, develop a musical style that was so militantly reactionary? His answer was moving. The music he wrote represented the Vienna he had known. Living in San Diego, he could return to this mythical place whenever he pulled out a sheet of manuscript paper. 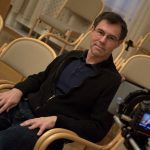 Only recently, the German historian and musicologist Albrecht Dümling reminded me that music composed in exile has a documentary value that has to be placed beside its aesthetic or historic value. In other words, why Fürstenthal wrote the way he did was as telling as the intrinsic aesthetic value of the works themselves. Fürstenthal started composing again only after re-connecting with the first love of his life, Franziska Trinczer, in 1973. Miraculously, she too had survived the Nazi years and was living estranged from her Swiss husband, working as a much published and highly regarded microbiologist at Harvard University under the name of Françoise Farron. Their last contact had been in 1939. It was she who now recalled his love of music and desire to compose and encouraged him to take it up again. As he was by this time a successful accountant and working as head of the auditing unit at the American Navy based in San Diego, his compositions were intended only for his own enjoyment. Starting in 1974, Fürstenthal wrote hundreds of songs, advancing into string quartets, then individual pieces for small ensemble and string orchestra. He set mostly German texts and over the years developed a style that moved from the Hugo Wolf template towards Richard Strauss and Joseph Marx. Subsequent meetings confirmed that he was interested only in having his music performed. He didn’t expect to earn any money, but simply needed to know that his music was valued. In San Diego it was easier to make the necessary conscientious leap in order not to be distracted by the fact that the music being heard wasn’t already a century old. But does expressive music that speaks instantly to the listener need the authentication of time and place? Indeed, as Dümling suggested, the authentication of Fürstenthal’s music was its very rejection of time and place in preference to the evocation of a now vanished alternative. Only the most eccentric would-be American composer might teach himself by taking Hugo Wolf as his model, while to Fürstenthal, that was the music of his homeland and to which he still felt inordinately drawn. He frankly didn’t care if the new-music establishment dismissed it. He wasn’t writing for their approval. 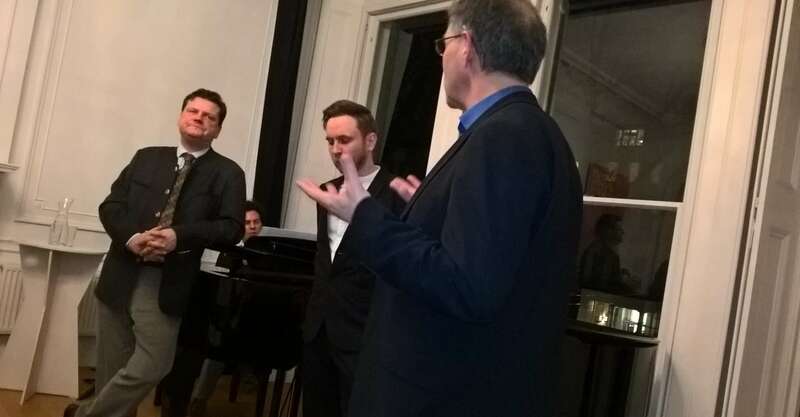 Sascha El Mouissi, Rafael Fingerlos, Michael Haas and (top, left) Martin Turba present Fürstenthal Lieder at the Austrian Cultural Forum, London, 12 December 2016. 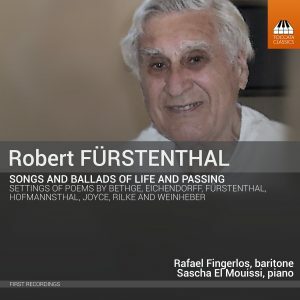 When last year the Viennese agent Martin Turba presented me with the young and highly gifted baritone Rafael Fingerlos with the question of how he might gain any kind of recording presence in a classical market clogged with recent releases of Schubert and Schumann, it didn’t take me long to suggest they look at the songs of Fürstenthal. In truth, it was exactly the right combination of hard-working, ambitious singer and composer. Fingerlos wanted to make a strong impression and could only do so with Fürstenthal’s best works. Today, he and his pianist Sascha el Mouissi are the only people to have worked their way through the trajectory of Fürstenthal’s development as a composer. As Fingerlos pointed out to me, it became clearer how he learned, with earlier songs starting off strong but suddenly hitting a block where it was evident Fürstenthal wasn’t sure how to proceed. Then they would suddenly stumble on the unexpected perfect song, followed by more experimentation, trial and error. To work through all of the songs was to work through Fürstenthal’s auto-didactic process. 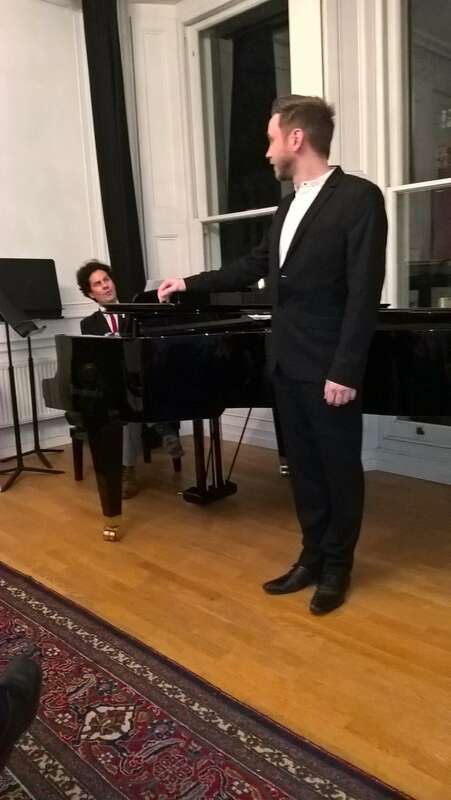 It was an enormous task that no singer with a more established reputation and tighter time-table could have undertaken. Another similarity to Arlen was the near- total absence of tempo, dynamic or expression indicators. This meant trying to fit different variants onto different songs, often with quite contrasting results. Unlike my recordings of works by Walter Arlen (released on the Austrian label Gramola), we didn’t have the composer present to clear up ambiguities. Again, it had the fingerprints of ‘exile’ all over it, composed in isolation as a means of private therapy. It accounts for fewer ‘up-beat’ numbers with his most beautiful works rather sombre and melancholic. Rafael Fingerlos and Sascha el Mouissi were determined to give the strongest possible performance of the most representative selection. 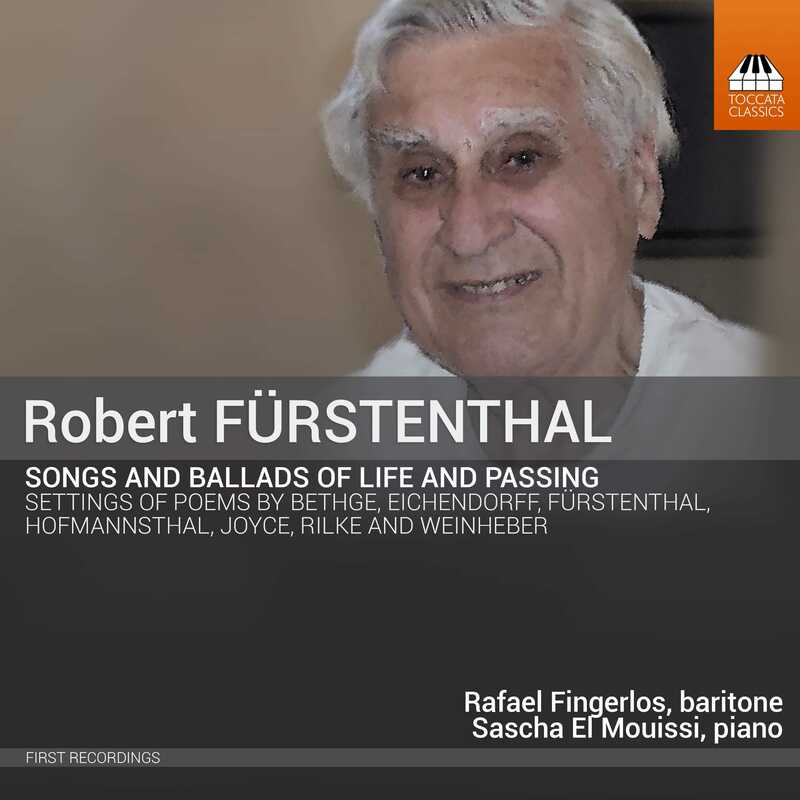 I believe the recording speaks for itself and we were lucky enough for Fürstenthal to have lived just long enough to have heard the first edit—he died on 16 November, aged 96, knowing that the world was at last about to discover his music. Michael Haas is the producer of the Toccata Classics recording of Fürstenthal songs (TOCC0354), co-director of exil.arte Zentrum, a centre for exile music studies at the Performing Arts University in Vienna and author of Forbidden Music: The Jewish Composers banned by the Nazis, published by Yale University Press, Yale and London, 2013. His blog on exiled and other such composers can be read at forbiddenmusic.org. I was very moved reading your affectionate article. My partner and I have known the Fürstenthals for more than 30 years and have been lucky enough to have them as our friends. His music has moved us many times, but not as much as their unstoppable enthusiasm of life. Robert was a dear friend and he will be much missed. I thank you for bringing his music to a wider audience.